PARIS, Jul 11, 2014/ — Elie Saab who is known for his luxe creations was inspired by Paris, the city of light and also the birthplace of haute couture! For without Paris, where will the exceptional craftsmanship only possible in haute couture come from? 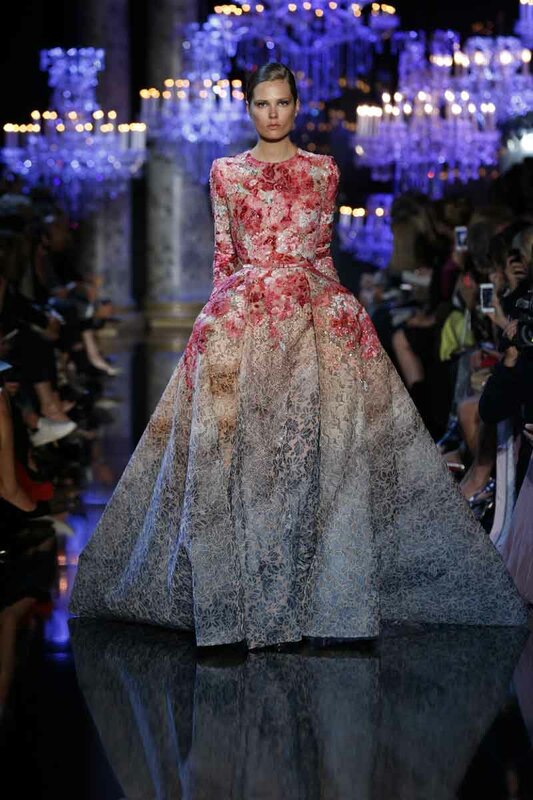 Hence, it’s fitting that Elie Saab take the city be his muse, together with the grandeur of a Parisian palace. Sending a collection that pay homage to the ethereal beauty of a Parisian twilight. The jewel-toned colors of the collection’s palette recall the faceted, prismic reflections of crystal chandeliers. Foliate and floral designs inspired by the arabesques of stately murals, wind their way across gossamer evening gowns or abbreviated, coquettish dresses. Fragile tulle and lace are tremblante with sequins and fine thread, surfaces shimmering with embroidery. Subtle yet luminous colors melt into one another with kaleidoscopic effervescence. Bleu glacier, midnight indigo and eau du Nil, are laid against nimbus white and onyx while deep peony fades into a brilliant shades of crimson. Antiqued rosé and copper add depth and warmth, flickering at the heart of the collection. For Fall/Winter 2014, ELIE SAAB captures the incandescent beauty of Paris illuminated by an iridescent lustre, as if in a dream.